DATE : Visit Skating Schedule for special events and times throughout the year. Click here to download the Open Hockey schedule. The High Performance Figure Skating Center (HPFSC) at the University of Delaware is one of the world’s leading training sites. The center is a year-round training facility designed to meet the needs of first-time competitors and champions alike. Its primary mission is to assist athletes and coaches in reaching their maximum potential. University of Delaware High Performance Center presents the Adult Seminar Series! Adults competing No Test thourgh Masters are welcome. All seminar series classes will include National, World, and Olympic coaches from the UD High Performance Training Center! 1 day - $125 - must register by August 26 for August 31 seminar,by December 23 for December 29 seminar and by January 14 for January 21 seminar. Any questions, please contact Isabella Cannuscio at bellac@udel.edu or 302-831-6051. The coaching staff at the High Performance Figure Skating Center ranks among the most recognized national and international in the world of figure skating, with several coaches inducted into the Professional Skaters Association Hall of Fame. Their concentrations include Freestyle, Moves in the Field, Pairs, Ice Dance, Choreography and Stroking. University faculty work closely with world and Olympic coaches to advance the body of knowledge in figure skating. Through cooperative efforts, they provide students with the most up-to-date training program available. 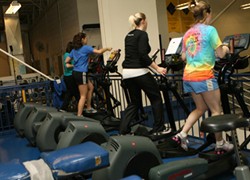 The HPFSC, which is housed in state-of-the-art facilities on the University of Delaware campus in Newark, provides the most complete training environment in the country. Skaters have access to two ice surfaces, at the Fred Rust Ice Arena and the Gold Ice Arena, as well as strength and aerobic training rooms and a dance studio. Professional stength and conditioning is provided as well as ballet instruction.